2.7 m high x 1.27 m across, shaft is 51 cm wide on the face and 29 cm wide at the side. This is a close up of the cross head, north side of the cross of Ss Patrick and Columba. 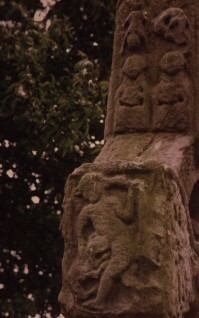 Top; two figures (?) Ss. Patrick and Columba? Harbison, Peter, The High Crosses of Ireland: An Iconographical and Photographic Survey 1, Habelt, Bonn (1992) High Crosses of Ireland, images, iconography, descriptions, bibliography..
Allen, J. R., Early Christian Symbolism in Great Britain and Ireland before the Thirteenth Century 1, , London (1887) . Allen, J. R., , ‘The Celtic Brooch, and how it was worn’. In The Illustrated Archaeologist (1894) 1, 162-175. Allen, J. R., , ‘On some points of resemblance between the art of the early sculptured stones of Scotland and of Ireland’. In Proceedings of the Society of Antiquaries of Scotland (1896/97) 31, 309-332. Allen, J. R., The Early Christian Monuments of Scotland 1, , Edinburgh (1903) . Brandt-Forster, B., Das Irische Hochkreuz. Ursprung - Entwicklung - Gestalt 1, , Stuttgart (1978) . Bigger, F. J., , ‘The Dextera Dei Sculptured on the High Crosses of Ireland’. In Proceedings of the Royal Irish Academy (1900) 22, 79-84. Calvert, J. A., The Early Development of Irish High Crosses and their relationship to Scottish Sculpture in the ninth and tenth centuries , University of California, Berkeley (1978) Ph.D., . Champneys, A. C., Irish Ecclesiastical Architecture 1, , London (1910) . Clapham, A. W. C., , ‘Review of F. Henry, 'La Sculpture Irlandaise'’. In Antiquaries Journal (1933) 13, 476-479. Crawford, H. S., , ‘A Descriptive List of Early Irish Crosses’. In Journal of the Royal Society of Antiquaries of Ireland (1907) 37, 187-239. Crawford, H. S., Handbook of Carved Ornament from Irish Monuments of the Christian Period 1, , Dublin (1926) . Crawford, H. S., , ‘The Early Crosses of East and West Meath, County Meath’. In Journal of the Royal Society of Antiquaries of Ireland (1926) 56, 1-10, 71-81. De Paor, M., De Paor, L., Early Christian Ireland 1, , London (1958) . Eberhart, I., , ‘The High Cross. An Art in Human Terms’. In The Arts in Ireland (1973) 2, 1, 54-59. Hamlin, A., , ‘Dignatio Diei Dominici: an element in the Iconography of Irish Crosses?’. In Ireland in Early Mediaeval Europe. Studies in memory of Kathleen Hughes (1982) 69-75. Whitelock, D. McKitterick, R. Dumville, D., Ireland in Early Mediaeval Europe. Studies in memory of Kathleen Hughes 1, , Cambridge (1982) . Harbison, Peter, , ‘On some possible sources of Irish High Cross Decoration’. In Festschrift zum 50jahrigen Bestehen des Vorgeschichtlichen Seminars Marburg. Marburger Studien zur vor- und Frühgeschichte I (1977) 283-297. Frey, O.-H., Festschrift zum 50jahrigen Bestehen des Vorgeschichtlichen Seminars Marburg. Marburger Studien zur vor- und Frühgeschichte I 1, , Gladenbach (1977) . Healy, J., , ‘The Unfinished Cross of Kells’. In Journal of the Royal Society of Antiquaries of Ireland (1891) 21, 450-455. Henry, F., , ‘Les Origines de l'Iconographie Irlandaise’. In Revue Archéologique 5th Ser. (1930) 32, 89-109. Henry, F., La sculpture irlandaise pendant les douze premiers siècles de l'ère chrétienne 1, , Paris (1933) . Henry, F., Irish Art in the Early Christian Period 1, , London (1940) . Henry, F., Irish High Crosses 1, , Dublin (1964) . Henry, F., Irish Art during the Viking Invasions (800-1020 A.D.) 1, , London (1967) . Herity, M., , ‘The Layout of Irish Early Christian Monasteries’. In Irland und Europa. Die Kirche im Frühmittelalter - Ireland and Europe. The Early Church (1984) 105-116. Ní Chatháin, P. Richter, M., Irland und Europa. Die Kirche im Frühmittelalter - Ireland and Europe. The Early Church 1, , Stuttgart (1984) . Hughes, K., Hamlin, A., The Modern Traveller to the Early Irish Church 1, , London (1977) . Keane, M., The Towers and Temples of Ancient Ireland 1, , Dublin (1867) . Kuhn, W., Die Ikonographie der Hochzeit zu Kana von den Anfangen bis zum XIV. Jahrhundert , Universitats Freiburg i. Br. (1955) Inaug.-Diss., . Leask, H. G., , ‘Irish Architecture and Sculpture during the Early Christian Epoch’. In Christian Art in Ancient Ireland (1941) 2, 77-86. Raftery, J., Christian Art in Ancient Ireland 2 1, , Dublin (1941) . Lucas, A. T., Treasures of Ireland. Irish Pagan and Early Christian Art 1, , Dublin (1973) . MacAlister, R. A. S., The Archaeology of Ireland 1, , London (1928) . MacAlister, R. A. S., , ‘The Ancient Insciptions of Kells’. In Journal of the Royal Society of Antiquaries of Ireland (1934) 64, 16-21. MacAlister, R. A. S., Corpus Inscriptionum Insularum Celticarum II 1, , Dublin (1949) . O'Neill, H., Illustrations of the most interesting of the sculptured crosses of Ancient Ireland 1, , London (1857) . Petrie, G., Christian Inscriptions in the Irish Language (ed. M. Stokes) II 1, , Dublin (1878) . Porter, A. K., Spanish Romanesque Sculpture I-II 1, , Firenze/Paris (1928) . Porter, A. K., , ‘Notes on Irish Crosses’. In Konsthistoriska studier tillagnade Johnny Roosval. Studier fran zornska Institutet for Nordisk Och Jamforande Konsthistoria vid Stockholms Hogskola VI (1929) 85-94. Porter, A. K., , ‘An Egyptian Legend in Ireland’. In Marburger Jahrbuch für Kunstwissenschaft (1929) 5, 25-38. Porter, A. K., The Crosses and Culture of Ireland 1, , New Haven (1931) . Roe, H. M., , ‘An interpretation of certain symbolic sculptures of Early Christian Ireland’. In Journal of the Royal Society of Antiquaries of Ireland (1945) 75, 1-23. Roe, H. M., , ‘The 'David Cycle' in Early Irish Art’. In Journal of the Royal Society of Antiquaries of Ireland (1949) 79, 39-59. Roe, H. M., The High Crosses of Kells 1, Meath Historical and Archaeological Society, Meath (1959) . Roe, H. M., , ‘Illustrations of the Holy Trinity in Ireland, 13th to 17th centuries’. In Journal of the Royal Society of Antiquaries of Ireland (1979) 109, 101-150. Ross, A., Pagan Celtic Britain 1, , London/New York (1967) . Stevenson, R. B. K., , ‘The Chronology and Relationships of some Irish and Scottish Crosses’. In Journal of the Royal Society of Antiquaries of Ireland (1956) 86, 84-96. Streit, J., Sonne und Kreuz. Irland zwischen Megalithkultur und frühem Christentum 1, , Stuttgart (1977) . Sexton, E. H. L., A Descriptive and Bibliographical List of Irish Figure Sculptures of the Early Christian Period 1, , Portland (1946) . Visser, G., Voskuilen, A., Zandstra, W., Die Ierse Kruisigingsikonografie van de 7de tot de 13de eeuw. I Tekst; II Catalogus 1, , Utrecht (1981) . Walcha, G., Beitrage zur Bandgeflecht - Ornamentik in Schottland. 10. Veröffentl.D.Abteilung Architektur des Kunsthist 1, Inst. D. Univ. Köln, Cologne (1976) . Weir, A., Early Ireland. A Field Guide 1, , Belfast (1980) .